ATLANTA (Aug. 4, 2014) — Atlanta’s low-income families who lack Internet access at home will receive some welcome news on this first day of school as Comcast is announcing a plan to provide up to six months of complimentary service for any new family that has not yet applied for Internet Essentials. Families who are approved for Internet Essentials between August 4th and September 20th, 2014 will receive up to six months of Internet service. At a 1:30 p.m. press conference that will feature the state’s political and educational leaders, Georgia First Lady Sandra Deal will join Comcast EVP David L. Cohen, Atlanta Public Schools (APS) Superintendent Dr. Meria Carstarphen, and Dr. Steven Lee, Atlanta Board of Education Member for District 5 at Peyton Forest Elementary School in Atlanta to announce the promotion, the donation of free laptop computers to all 147 of the school’s 4th and 5th grade students, and to draw attention to a digital divide that has left many Georgia families without access at a time when the Internet has become vital to learning. Comcast is also announcing an amnesty program for certain low-income families who could qualify for Internet Essentials, but have a past due balance. Customers who have an outstanding bill that is more than one year old are now eligible for the program. Comcast will offer amnesty for that debt for the purpose of connecting to Internet Essentials, so long as the customer meets all the other eligibility criteria. Launched in 2011, Internet Essentials is the nation’s largest and most comprehensive broadband adoption program, providing low-cost broadband service for $9.95 a month plus tax, the option to purchase an Internet-ready computer for under $150, and free digital literacy training. 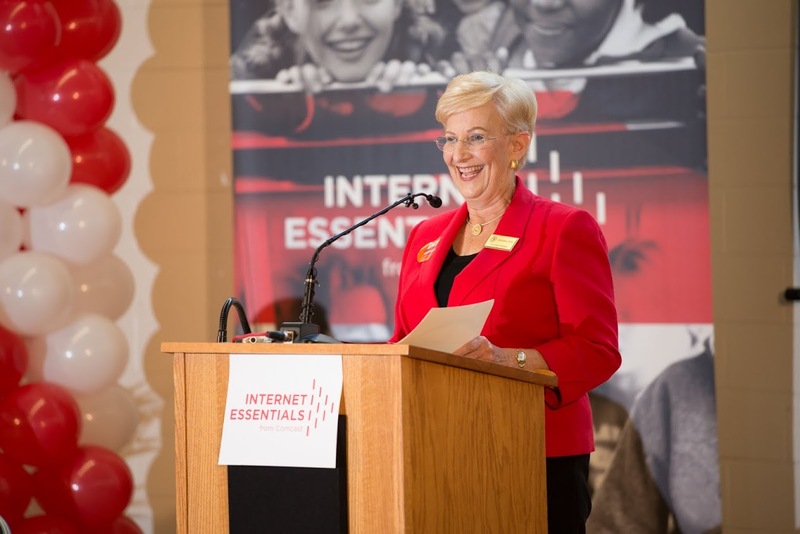 Since its start, Internet Essentials has connected 350,000 families, or about 1.4 million low-income Americans, to the power of the Internet. It is available in 39 states and the District of Columbia. Nearly 100,000 Georgians – or 25,000 families in the state – have benefitted from the Internet Essentials program, an important achievement as broadband access becomes an increasingly vital educational resource for students of all ages. Atlanta boasts the second highest number of Internet Essentials sign-ups across all Comcast markets. Throughout the back to school season, Comcast will actively engage with parents, teachers, non-profit partners and elected officials to help spread the word to low-income families about the program. The Company plans to air an unprecedented number of public service announcements (PSAs) that promote the new, up to six months free offer, and to focus on schools where 100 percent of students receive a free lunch through the National School Lunch Program and can therefore automatically apply. Comcast will also continue to offer families the option to purchase a computer at less than $150, as well as provide access to free digital literacy training online, in print and in person.